When analysing the US housing bubble, four states stand-out for the way in which home values rose into the stratosphere before crashing and burning: California, Nevada, Florida and Arizona (see below chart). 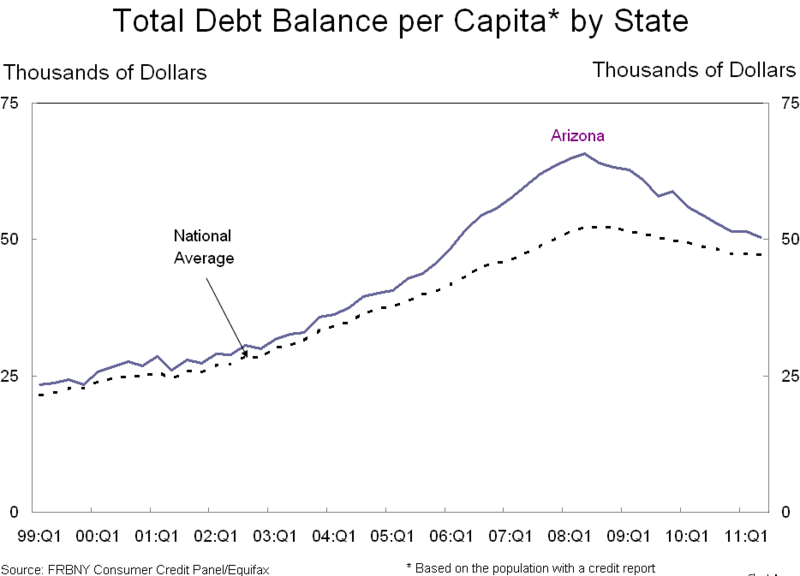 Since I covered three markets were covered in previous posts at Macrobusiness (see above links), I now want to analyse the Arizona housing market – with particular emphasis on its largest city, Phoenix – to determine why prices bubbled and then burst in such a violent manner. The rest is history. Home prices continued falling, unemployment kept rising, and nominal per capita incomes fell for the first time in at least 40 years. So what went wrong? Could anything have been done differently to prevent the housing bubble/bust? Certainly, if credit was less readily available, households would have been constrained in their ability to bid-up prices. But easy credit was only part of the problem. Another key driver of the rampant price escalation and then collapse was the way in which land was supplied for housing. 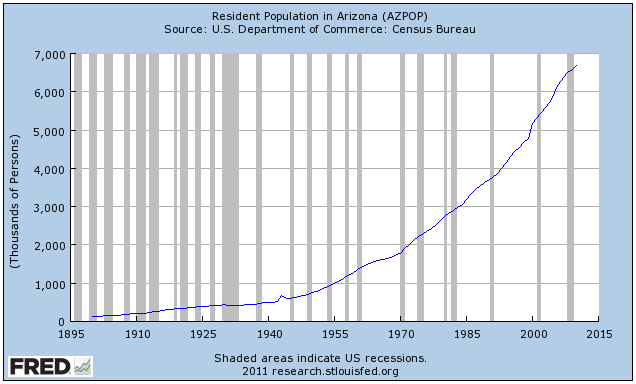 Throughout the 2000s, Arizona was one of the fastest growing metropolitan area in the United States with more than 1,000,000 population (see below chart). The State of Arizona passed statewide planning laws in 1998 and 2000, which included the implementation of high impact fees on new development and urban containment devices. In a 2006 study of land-use policies in the 50 largest metropolitan areas of the US, the Brookings Institution ranked Phoenix as ‘growth management’, which is the same ranking as Florida and California. 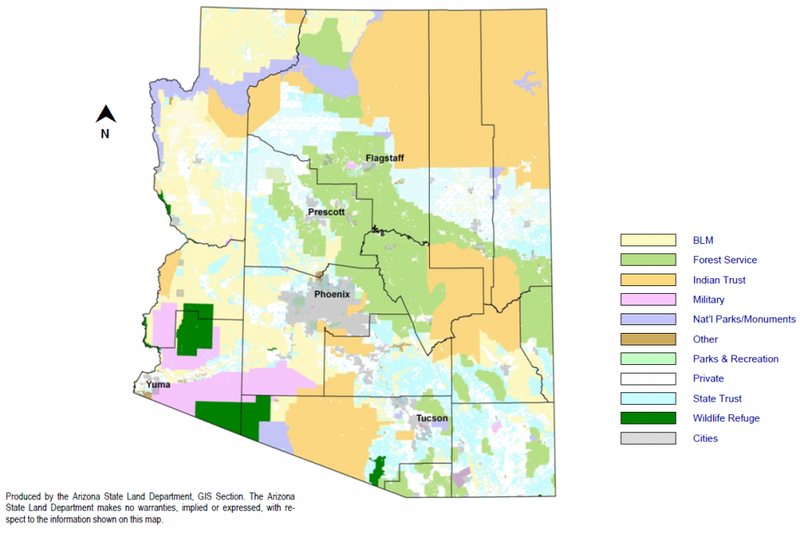 The overwhelming majority of potential developable land in Arizona is either owned by the state and federal governments, preserved for conservation, or otherwise off-limits to development. On the second point – the lack of available land for development – the below graphics highlight the land supply situation in Phoenix. There is evidence that the Arizona State Land Department, whose mission is to “optimize economic return for the Trust beneficiaries”, heavily restricted sales of land to the market in an effort to maximise revenues, causing builders and developers to bid-up land price in period auctions to ensure their supply of land for construction (called ‘land banking’). Whereas the price of land for housing sold for around $40,000 per acre immediately prior to the bubble, at the peak average land prices fetched nearly $200,000 (see below chart). Obviously, this land price inflation was a principal cause of the house price escalation as well as the delayed supply response to the rapidly growing population and rising house prices (see below chart). Had land around Phoenix been freely available for development, developers would likely not have paid such high prices for the land sold by the state government and Phoenix home prices would never have risen to such heights or crashed as violently. 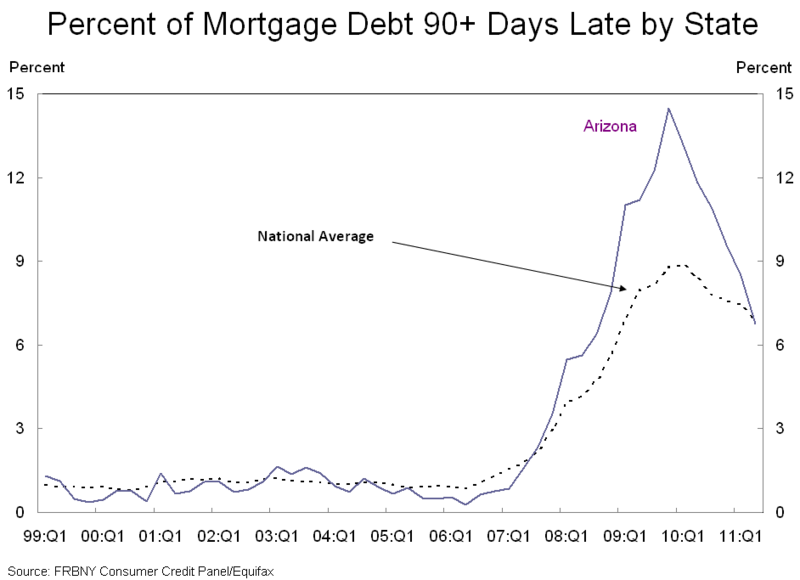 Phoenix is yet another example of where excessive government interference in the supply of land has combined with easy credit to create a speculative bubble followed by a painful bust. This piece originally appeared at Macrobusiness. Leith van Onselen writes daily as the Unconventional Economist at MacroBusiness Australia. He has held positions at the Australian Treasury, Victorian Treasury and currently works at a leading financial services company. Follow him @leithVO. Excessive Government Interference in Phoenix? Submitted by bjohnson48 on Tue, 11/15/2011 - 19:14. Mr Van Onselen's article is really strange to one who has been in commercial real estate in Phoenix for the last two decades. I would have thought one of the Newgeography editors would have found his argument a trifle strange as well, since Phoenix exemplifies some of the attributes that Kotkin et al espouse. Yes, much of the land in Arizona, the state, is unavailable for development, either Federally-owned, state-owned, or Indian lands. But in the metropolitan area that is Phoenix there are and have been huge tracts of private land available for development. You can see all of the agricultural land waiting for single family development just by looking on Google Maps. (note-the stuff due east of Scottsdale is Indian-controlled) The state lands that have been development targets over the last decade have been primarily to the northeast (Desert Ridge, etc.) and the far southeast in Pinal County. In any event the department was throwing as much land as they could into developer's hands during the entire decade. Yes, their average auction prices per acre rose dramatically, but they were a small proportion of the land actually developed, and in any event a number of the largest and priciest auctions (at the peak) were for mulifamily development and were subsequently cancelled. According to 2005-era reports by RL Brown, the local single-family guru, there was no shortage of developable land at the time. 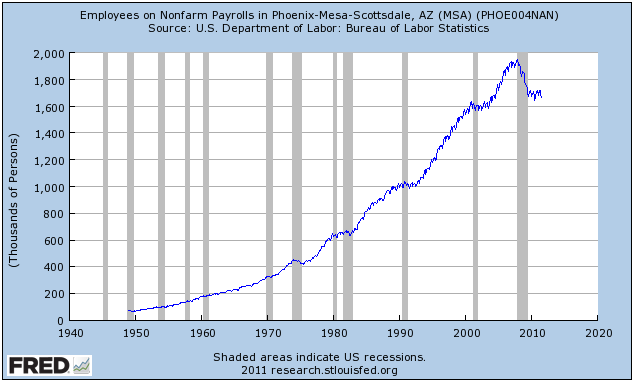 And to call Phoenix a 'growth management' area is just silly. The state land management laws referred to are extremely modest, involving minimal subdivision regulation and the like. Impact fees here are laughable compared to California and many other states. Before 2007 they maxed out at $20K/house, but most areas were below $10K. The City of Phoenix, one of the physically largest and sixth most-populous in the US, has no impact fees except for a few far north and far southwest areas. 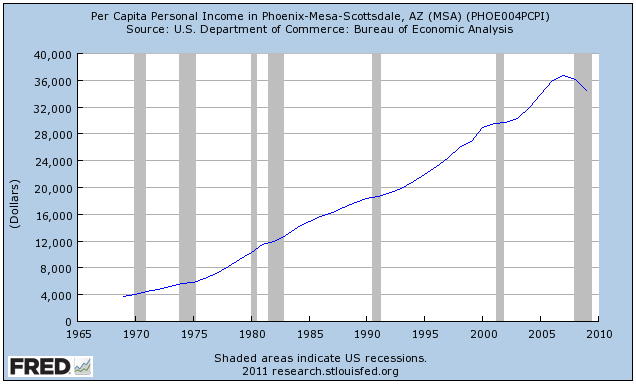 Tucson had fees of $1.4K/single family house then. Mesa, $5K. Scottsdale, $1.7K to $5.7K/house. (These four cities constitute about 60% of the state's population.) Portland is a growth management area--Phoenix is the opposite. We were permitting the equivalent of 4% of the total inventory of single family houses in the county per year from 2003-2006, and more if you include Pinal County. What other US city of any size except perhaps Las Vegas has done so ever? Does that sound like an area of constrained development? Barriers to development here are very modest except in some high-dollar perserves of North Scottsdale, Gilbert, North Tucson and a few other isolated enclaves. The residential land and house value analysis referred to in the article (by the Lincoln Institute of Land Policy) may have some comparative theoretical value, but the numbers it comes up with are ridiculous and bear no relevance to the actual supply and demand forces in the mid-decade. It has home values in 2006 averaging $426K with the land component at $274K, or 64% of the total. Here in the real world neither new nor resale house prices ever averaged more than $350K, and lot prices as a proportion of new home prices never exceeded 30% unless it was one of the multimillion dollar houses with elevation, views and privacy. I see their most recent land value is now under $10K per house, about 5% of their (theoretical) total house value. To characterize Phoenix as an area of "excessive government interference in the supply of land" is one of the goofiest things printed in this year of a massive number of goofy statements. I personally agree with much of what I percieve as the Kotkin approach to land management analysis. I think the denigration of much recent development as sprawl reflects a fundamental mischaracterization and misunderstanding of what ordinary Americans desire in a place to live and work. But this article just tries to force Phoenix into a simplistic explanation of the housing boom and bust, an explanation that might have marginal utility in California but none at all here in Phoenix. Except in terms of unintentional humor. Submitted by ArenaTablet.com on Sat, 06/06/2015 - 11:38. Submitted by NEOFORD on Tue, 11/15/2011 - 01:39. Interesting observations. But I think you're missing another key ingredient. You allocate the cause to land supply limitations (true), excessive household debt (true), and a restrictive/high cost entitlement environment (true). What about the other elements of the demand equation, aside from the increased ability of Phoenix households to "own" housing during the boom. You have to ask yourself...did the land use environment in California contribute to these conditions in Phoenix? I don't have any quantitative back-up, but I suspect net migration between Southern California and Phoenix during the "boom years" was extremely negative. Anyone who has lived or worked in CA during the past 10 years probably knows someone who moved to Phoenix, or whose employer moved to Phoenix. And why did they move...? Because California was far too expensive. Submitted by Rick Harrison on Sun, 11/13/2011 - 17:11. As a land planner for 'that suburban sprawl' working in 46 states in our country, the common thread between California, Nevada and Florida is the mindless planning (extreme cookie cutter) of the suburbs. While there are spatterings of nicer developments here and there, most of the land had been quickly subdivided more in terms of getting the plan quickly out the door of the engineering (the planning firm is most often engineers 'planning' from their automated CAD system functions)meeting regulatory minimums. These minimums typically offer miniscule lots compared to other areas of the country with a 20 foot deep front and rear yard setback (if that much), offering very little space. Florida is no stranger to boom and bust - I've been following that market for over 30 years. The Las Vegas suburban region is one of the worst planned areas I've witnessed - plenty of fuel there for anti-growth and anti-suburban comments. The problem with poorly planned cities, is that they can fail if there are better competing cities sprouting up over time offering better quality of housing with more space for families. Unlike cars that can be recycled somewhat easily - cities cannot be rebuilt painlessly. In areas I visit I like talking to residents, city workers, developers, builders, and so on... with residents (the end user of land development) comments being most critical. This is what I've experienced in these areas over the past 20 years. Builders and developers claimed that their customers wanted the smallest possible yards and justified extreme single family densities. Of course these extreme densities created much higher profits. This has been pretty much the exclusive comments from the developer-builders. When we questioned the end users - the residents, they most often had one big complaint - too close to the neighbor and they yearned for larger yards. I believe, as we pull out of the recession the country will be playing musical cities (chairs). Those with job opportunities will stop at the cities of employment. Businesses may take a new look at areas offering higher living qualities with new development that offers more sustainable living. Should that happen, businesses will go where workers will be happier and more productive, leaving the unsustainable cities behind. Submitted by ExExZonie on Sat, 11/12/2011 - 18:24. There's a development on the far west side of Phoenix called Tartesso. It was build on land annexed by the city of Buckeye. The homes are pretty nice but at least 50 of them are abandoned now. We had property as a nearby development called Sun Valley Estates near Roosevelt and RH Johnson Road. We were very excited when Tartesso and other developments were planned for the area, along the Sun Valley Parkway, which was a road built in the 1970s for another failed development in the desert. So some of that land was already owned and abandoned long before this recent boom. But the point is that when you restrict the supply of any commodity or other factor, the price will rise. To create the types of communities that people are willing to buy in, you need large tracts of land that were either former farms, or land with available water or aquifer, or other large developments. If that means you have to go to the government, hat in hand, they have a significant advantage. Not only that, but the city and state governments grew to meet the new flood of money coming in during the housing boom, and are now going through a painful period of cutbacks and austerity. Another new housing area called Verrado was built on the former Caterpillar test track near the White Tank Mountains. Verrado succeeded, however, while Tartesso struggled, probably because the latter is too far from Phoenix and from amenities like grocery stores, gas stations, medical facilities, employers, etc. So the high prices they were charging for the homes, coupled with the cost of driving and the significant distance to any likely employers, led to many abandoned houses (some partially built) and many foreclosures once employment started crashing. Government does not know best, almost ever. It only knows how to scrape up more and more wealth from those who earn it. Phoenix housing as "bad planning"
Submitted by grcarch@charter.net on Thu, 11/10/2011 - 21:22. Never mind that Phoenix has represented an epitome of bad planning for many years, as nearly as I can tell, Joel Kotkin and his hangers on have never seen a suburb they didn't like, and are essentially development industry hacks justifying sprawl to the horizon. Folks are hurting economically for a variety of reasons, but constraining urban growth and infrastructural extension ad infinitem ain't one of them.